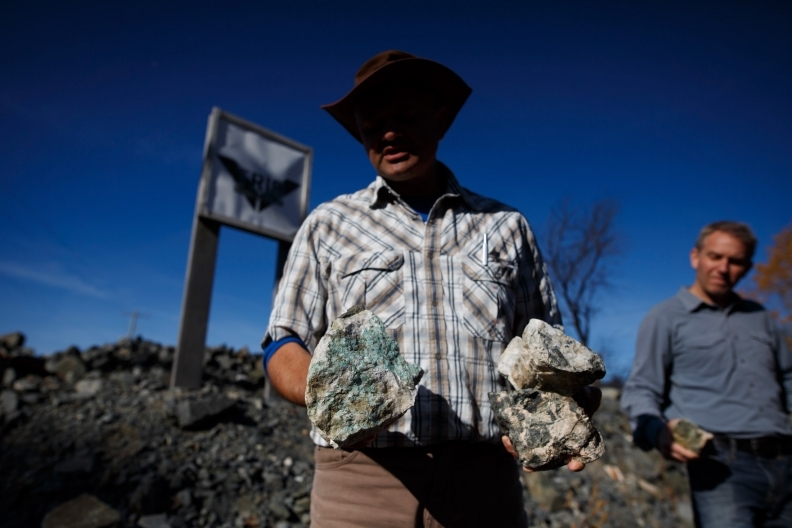 Frank Santaguida, First Cobalt's vice president of exploration holds rocks containing malachite deposits as he describes mineral samples outside Cobalt, Ont., on Oct. 12, 2017. Ironically, Cobalt, Ontario—population 1,100—was built on silver. Remnants of a boom that transformed the town more than a century ago are everywhere. A mine headframe still protrudes from the roof of the bookstore, which was previously a grocery. The butcher used to toss unwanted bones down an abandoned 350-foot shaft in the middle of the shop floor and keep meat cool in its lowered mine cage. While the last silver mines closed almost 30 years ago, a global push for the village’s namesake metal is promising to breathe new life into the sleepy town 500 kilometers (300 miles) north of Toronto. The whitish element (which “blooms” pink when exposed to air) was initially ignored by the area’s prospectors and later mined mainly as a by-product of silver. Now, global demand for cobalt, a component in batteries used to power electric cars for automakers from Tesla Inc. to Volkswagen AG, is changing the game. Call it a cobalt rush in Cobalt. 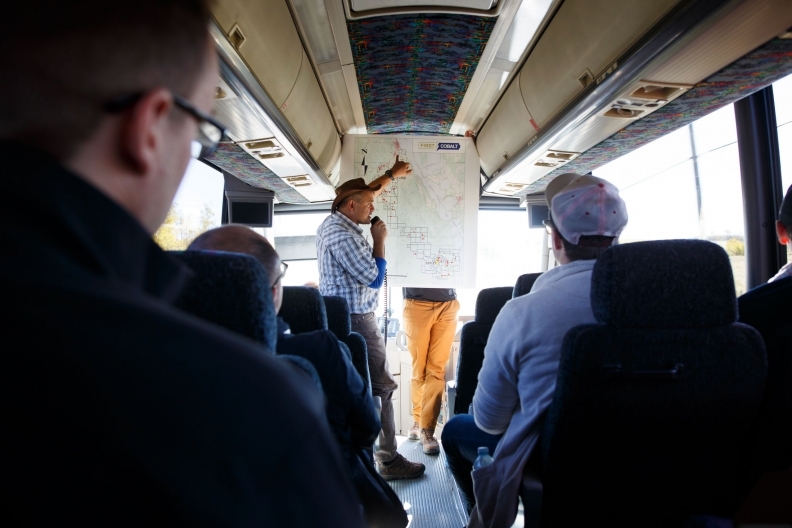 Frank Santaguida, First Cobalt's vice president of exploration, uses a map to explain mining properties to investors, analysts and geologists touring company properties outside Cobalt, on Oct. 12, 2017. Cobalt, both the town and the metal, are attracting renewed attention as a buffer to rising political risks in the Democratic Republic of Congo, which accounted for more than half the world’s 123,000-ton production in 2016, according to Natural Resources Canada. China and Canada were a distant second and third, each contributing roughly 6 percent of supply, followed by Russia and Australia. But as concerns grow about country risk in the DRC, even as demand swells, those smaller players stand to benefit. Stock investors betting on cobalt are already benefiting. First Cobalt Corp., a Canadian miner exploring in the Cobalt area, has soared 90 per cent this year. Cobalt 27 Capital Corp., another miner based in British Columbia, has jumped almost 600 per cent. Neither company has any revenue. The heightened interest in the metal is evident in Cobalt. Earlier this month, two dozen investors, bankers and hedge fund managers from as far away as Shanghai boarded a chartered plane and then a bus from Toronto through the autumnal splendor of Ontario’s boreal forest. Their host was First Cobalt, a Vancouver-based miner that recently abandoned the Congo in order to secure more land around Cobalt’s old mining camp. “We’ve got some of the biggest resource companies in the world interested,” said Trent Mell, First Cobalt’s chief executive officer, fresh from eight weeks of travel through the U.S., Europe, Australia and Asia pitching his company to investors. Given that early prospectors more or less tripped over the abundant silver deposits, the area is largely a blank slate when it comes to proper exploration, he said. Although cobalt was later extracted from the area, notably by Toronto-based Agnico Eagle Mines Ltd. until the late 1980s, Mell believes much remains undiscovered, particularly at the site of failed silver mines. Both metals are even part of Agnico’s name, which comes from the periodic table symbols for silver (Ag), nickel (Ni) and cobalt (Co). Yet it was silver that first drew prospectors to Cobalt 115 years ago. Contractors looking for lumber to expand the Canadian railroad discovered visible silver in the loose rock. Within two years, 600 prospecting licenses had been issued and by 1907, that had swelled to almost 10,000, according to records housed in the Cobalt Mining Museum. The newly born town was simultaneously cosmopolitan and raucous: while mine owners enjoyed an opera house and a gentlemen’s club, their employees let off steam at “blind pigs,” illegal watering holes named for the unfortunate animals on which bootlegged alcohol was tested. Today, the remains of those heady days are still visible in the crumbled foundations, capped mine shafts and piles of waste rock scattered in back yards throughout the town. More than 420 million ounces of silver came out of the Cobalt camp during its first 60 years and the town is built on a “honeycomb” of old mining tunnels and trenches, according to its mayor, Tina Sartoretto. Sartoretto is hoping the renewed demand for cobalt will inject some economic life into her impoverished town. With no industrial base to speak of, the town struggles to survive on legacy endowments from past silver and cobalt miners Agnico and Teck Resources Ltd. 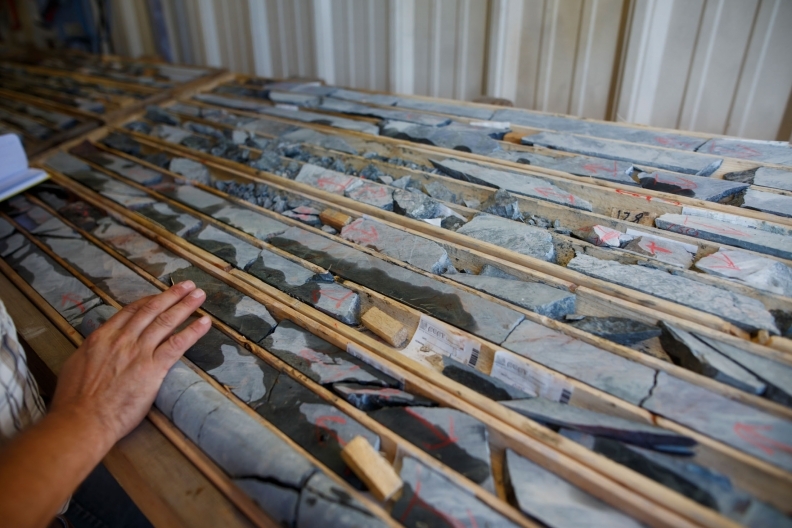 Core samples on display for viewing at First Cobalt's facility outside Cobalt, Ont., on Oct. 12, 2017. Sartoretto’s hope is that future mining will include plans for sustainable economic development tied to the metal. “If you were producing cobalt here, it would be nice if you could produce batteries here,” she said. Depending on how First Cobalt’s exploration unfolds, the landscape in and around the town could be altered yet again. The company’s vision is for at least one open pit mine over a kilometer wide, said Frank Santaguida, First Cobalt’s vice president of exploration. The Toronto-based company, which is focused on gold, does remediation in the area and has no plans for exploration, said Dale Coffin, an Agnico spokesman. Where Agnico doesn’t have claims, interest is building. Prospectors regularly come into the bookstore, hoping to discover old mine maps and surveys. Chitaroni is always on hand to tick off the advantages of Cobalt compared with more remote mining jurisdictions, including access to power, hydro and expertise.